Nastymarine's (2)Undying Lands takes motw this week! The vote was pretty close between this map and GriG's Endorphine. This map's most interesting feature is its nat which is a wall to the main. This means you have a little mining to do before you can expo, and it means all of your troops will have a hard time getting out of your cramped base! The map is well decorated and boasts liberal (and well executed) use of inverted ramps. Many of the expos are on cliffs, possibly favouring drops. With three entrances to the nat, three to the mineral only near you, and two paths to the mains, you'll have fun moving around this map! Congratutlations to Nastymarine, and here's the melee to download! oh noes an observer map here! 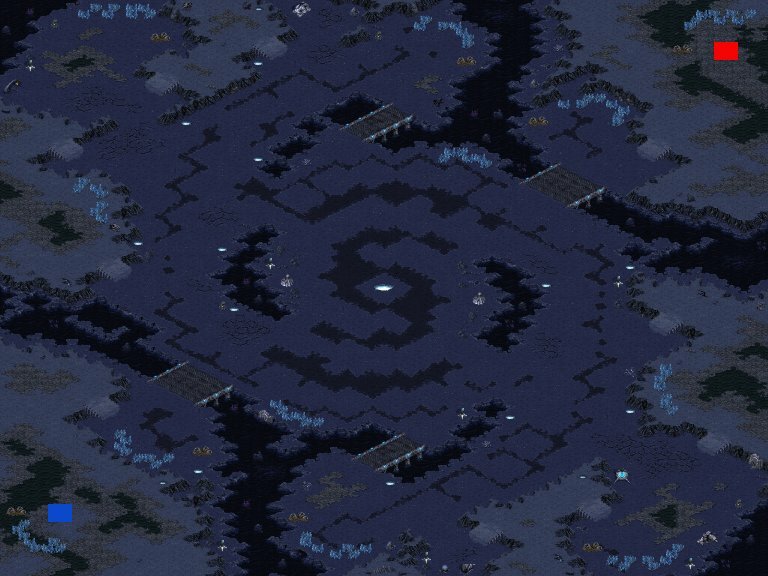 and here's the map thread to spam! Er I mean post constructive criticism and give your feelings on the map! Ok Nightmarjoo's birthday is the 7th of November, which was the deadline for entering maps, it is not the deadline now though. I made this competition first and foremost to encourage competetive mapping, and I think that always results in nice maps being made. Let's see your best maps here. The maps may incorporate a neutral city; doodads and buildings can be used, as well as civillians. This could be a way to tighten an open middle to help that balance. This part is not required, but would be interesting to have. If doing this, make sure units don't act retarded around the city. The city is intended to be destroyable. Obs versions are required if it's a 2 player map. Obs versions would be nice to have with the other maps too. For the overall feel, think snowy cityscape. This means use compound. For example, you could have a fairly tight neutral city in the middle with compound walls dividing the middle from the not so middle, with more open sides for expos and moving. Maps with the gas issue will be removed from the competition immediately. Such maps can reenter once the issue is fixed. I would apreciate it if you worried about wandering (see Antrax edge for what wandering is), but this is not required. The maps must have nice mineral formations for the mains where a split is easy, and workers don't go around minerals and do stupid things like that. Pay attention that the nat is not in the way of the main. Make sure there is enough room in the mains for building. I don't want small main/huge nat concept here. Be concientious to all races. I would rather you allowed an early expo which defended the main too, but this is not a requirement. Good luck and have fun. There is plenty of time to make these maps. I will be making the final decision, but I will consider the vote's winner too. I encourage people to vote on the maps after the 21st, because it shows what your fellow mappers think of your maps. For making a map, if you have any concepts you would like to use for the map which either violates the requirements, or you are unsure about the requirements, please leave a comment here or pm me. This week's motw is LostTampon's Chaos Theory! This is a well made map, with a nicely performed balance of open and tight areas. This map, unlike many these days, features no custom or illegal features. It is 100% standard made. Of course, it is number 1053 in our map database, so it is fairly old. Ok we had an 8 player double elimination bo3 with bo5 finals. The maps were advent, naz(i)ca, curtain call, and undying lands. As usual there were complaints about the maps. Please post comments here. I will try and gather the reps for one rep pack instead of a bunch of reps on the tourny site. The winner was GRC-Deathlink, author of Nazca. The second place person was lnept. This was a really long tourny, organized completely by Nightmarjoo, because all the other admins didn't show up. Congratulations to Deathlink for his win, and praised be Nightmarjoo who ran the whole thing. And amid some confusion with the brackets, the tournament was a nice one. You know what's the meaning of life? There is some story someone let a computer calculate it, and his result was: "42". So GriG should be really happy to win this week's MOTW with his map advent. This week's MOTW was late and it was a hard decision, as four maps had a serious shot at winning, but someone's got to make the decision, and in that case it's me who does.